1.1 Why to follow this droid vpn unlimited trick? Hey friends on techintor we are here with an amazing stuff. We have posted so many Internet tricks on our blog by which you can use free Internet without even paying even a single penny and most of the tricks works with droidvpn app which is a paid app. Means you have to Pay for it. Though you can make use of free version but paid version gives you full freedom to use most of the locked features. Don’t worry we are here to give you droid vpn premium app just for free. Yeah by this trick you can bypass droid vpn daily limits of 100MB. As i said above, many free internet tricks for android platform working on droid vpn. We shared one Airtel free Internet Trick For Android users is based on droidvpn. Due to Droid VPN daily limit all these tricks are limited. So here on this article we are sharing droid vpn premium account trick. Means you can surf all advantages of droid vpn premium account for free. Somehow we can call, all our free internet tricks based on droid vpn now converted to unlimited tricks by this droid vpn premium account trick. So let’s go further – Droid VPN unlimited Trick.. It will help you in unblocking any website that’s locked. Many times we saw that many popular sites like Facebook and YouTube are blocked so at that time it will help you. Just use that app and surf freely. It protects your privacy by making you anonymous and encrypts all the the internet data. Every time you visit a new website, you are exposing yourself, leaving a digital fingerprint in the form of an IP address. A programer may use this information to try to access your sensitive information or steal your passwords. Droidvpn helps in protecting your identity and makes you anonymous. When comes to Free internet tricks, DroidVPN plays a great role. We can edit Header files in DroidVPN, so it is very easy to work many tricks in droid vpn. Use premium droidvpn unlimited without paying nothing. It’s user friendly interface is very easy to use. Use this app in Free Internet tricks. Boost your Downloading speed instantly. Why to follow this droid vpn unlimited trick? In Droid VPN free accounts [trial accounts] you will get only 100mb per day. your data is limited to 100mb per day. By following our trick, you are able to enjoy unlimited data in droid vpn. 1. First download droid vpn from playstore or anywhere. 4. 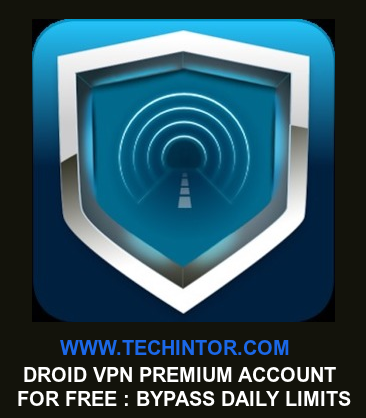 Now open droidvpn app[ droid vpn settings>> configure account>>] and on user name and password field use any of your account details [ created from above]. 5. Now start consuming data on droidvpn. surf upto 100MB. After that disconnect droid vpn and exit app. 6. Then open android ID changer and generate a new random android id. [click on the plus icon at the right top for generating a random android id]. Now save the new android id and close the app. 7. Now again open droid vpn app and goto settings>> configure account>> and enter other user name and password. and connect droid vpn. 8. After 100 Mb usage again repeat these steps. In this way you can surf unlimited data in droid vpn with more droidvpn trail account. i am not doing again. tnx. i am new to blogging, i like ur blog. trick updated.. check new trick with android id changer. working fine. bihar ke koi trick hai jo bihar me work kare. we will update with new tricks soon.